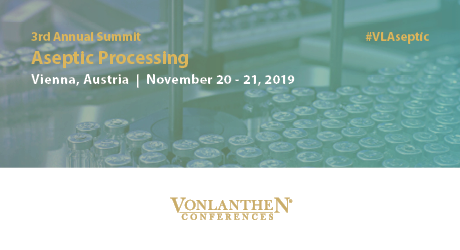 Vonlanthen Group is pleased to invite you to the 3rd Annual Aseptic Processing Summit scheduled on November 20-21, in Vienna, Austria. At this Summit, participants will be given the opportunity to gather for discussion and to network with peers involved in pharmaceutical manufacturing, aseptic fill and finish, quality control, engineering and container development. Key topics in aseptic processing will be discussed by some of the industry’s leading lights. This conference will give you a broad overview of current changes in the European regulations, modern technical trends and innovations.